When Marvel Studios unveiled the second trailer for Captain Marvel, many fans were impressed by how incredible Brie Larson looked as Carol Danvers and her superhero alter-ego Captain Marvel, adored the interactions she had with an eyepatch-less Nick Fury (Samuel L. Jackson), liked the inclusion of a pro-girl message, and were blown away by the space battle sequence teased at the very end of the footage. Clearly, there was a lot to love in the newest Captain Marvel trailer — but one specific element of it means more than everything else. Amid the action scenes and the eye-catching CGI and the fuzzy (but most likely evil) cat Nick befriended, the latest look at Captain Marvel effectively solved a potential Avengers 4 plot hole that regards Carol Danvers' age. We know that Captain Marvel tells Carol Danvers' origin story, and to do that without making a mess of the existing Marvel Cinematic Universe timeline, directors Anna Fleck and Ryan Boden are rolling the clock back 23 years and introducing the hero in 1995. Learning that Captain Marvel would take place in the 1990s, an announcement made during Marvel's presentation at San Diego Comic-Con back in July of 2017, was exciting (the prospect of seeing bucket hats, matching plaid sets, scrunchies, and slip dresses in a Marvel movie is enough to inspire some nostalgic laughs), but it was also somewhat confusing, since Carol Danvers is also lined up to appear in Avengers 4. If Captain Marvel is set over 20 years prior to the events of the Avengers: Infinity War sequel, wouldn't that mean she would be middle-aged by the time she shows up in the forthcoming film? And if she isn't pushing 50 in Avengers 4 (not that there's anything wrong with silver-haired superheroes) and does appear in the film in the same youthful form that she does in her solo movie, does that signal time travel is to thank for her involvement? With those questions rumbling around in their brains, fans were worried Avengers 4 would feature a huge plot hole if it included a young, Captain Marvel movie-age Carol Danvers without explaining why she seemingly didn't age a single day from 1995 to 2018. 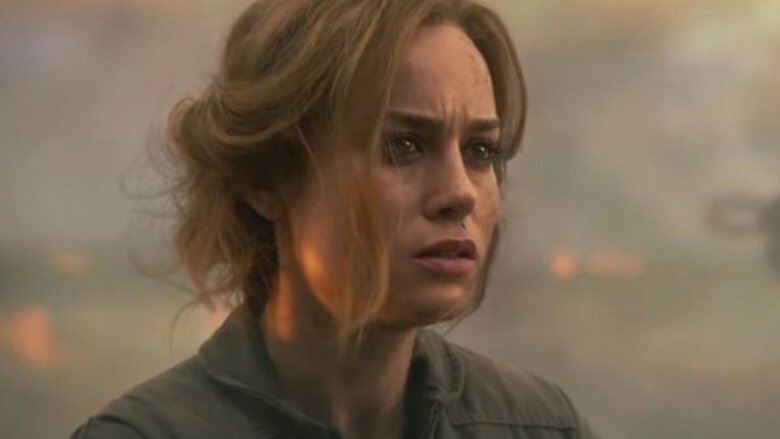 Thankfully, though, the new Captain Marvel trailer wiped that worry away when it revealed the real reason for Carol's perpetually youthful appearance: it's not due to time travel or any high-end anti-aging creams and serums, it's result of the accident that left her human body imbued with DNA from the alien race known as the Kree. Screen Rant's Cooper Hood had the full, in-depth explanation. In the footage, we see Annette Bening appear as an unnamed, mystery character who explains to Carol her Kree origins, telling her that the Kree rescued her when she was in trouble and couldn't remember who she was. "We made you one of us. So you could live longer, stronger, superior," Bening's character says. "You were reborn." To the average watcher, those lines might not hold much weight. Yeah, of course Captain Marvel is physically powerful and superior to humans whose DNA isn't comprised of half Kree genetics! That's the kind of stuff that makes superheroes superheroes! But it isn't the mention that Carol is tougher than she was when she was just an average woman, or that she's more skilled than her peers now that she's technically half-alien, that's important here; it's the note that she has been "reborn" to "live longer." This means that Carol will outlive regular humans and will age at a significantly slower rate, thus explaining why she will barely have gotten any older between the time of her accident in Captain Marvel and when she heads back to Earth in Avengers 4. Someone who will feel the effects of time, however, is Nick Fury. Marvel digitally de-aged Jackson's character for Captain Marvel, but he'll appear significantly older in Avengers 4. By the time Nick paged Carol for back-up in the post-credits scene in Avengers: Infinity War, he was sporting some white in his hair, wrinkles on his face, and his signature patch over his eye. When Carol shows up to fight the good fight in the film, she'll be youthful as ever — marking what's probably the first time in history where a woman has gotten a better deal than a man when it comes to aging. Even with this plot hole-clearing, there's still much about Captain Marvel fans have yet to discover. The good news is that they won't have to wait too much longer to see the film in its full glory and learn the whole story of Carol "Gonna Live Forever" Danvers. Captain Marvel will soar into theaters on March 8, 2019.